Plumbing, painting, decorating and general maintenance. My services might be varied, but they all come with the same promise of quality, dedication, and durability. Licensed and insured, I’m an experienced plumber and decorator with nine years of experience. I offer a friendly and informal initial consultation along with a free and detailed estimate so that both you and I are confident in what will be done and for how much. Hi, My name is Brett of Bretts-Plumbing.com. The Company is new with the core of the business in Kitchen & bathroom fitting. I have a couple of years experience as a plumber, and so far so good. In addition I also have over 10 years experience in Painting & decorating along with General building Maintenance. I feel my skills for the core of my business in bathrooms & kitchens, are substantial in the fititment aspect along with the plumbing & tiling which assists me in the cutting edge of design with the finishing touches (decoarting) that i bring to the table. niether having to rely on others to do there jobs properly which as part of the whole package becomes frustrating. 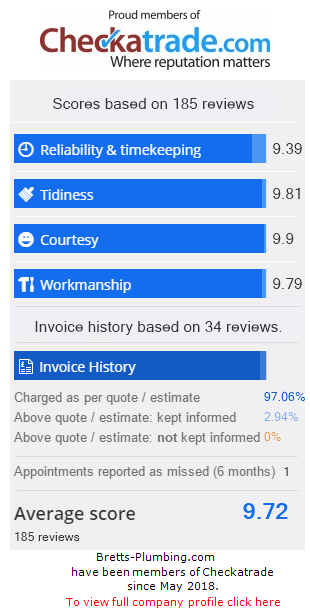 At Bretts-plumbing.com we pride ourselves on honest customer feedback & keeping with client budgeting and making savings for the client at every opportunity every step of the way. ensuring quality finishes to everything that we do. If we cant do it - we'll tell you we cant do it but we'll also tell you who can and manage that for the ultimate customer package experience. Proud Members of Checkatrade & Expert trades. Call out charges apply only in Emergency out of hour times which are between 8pm & 6am. Monday to friday and the 48 hours of the weekend. The call out charge is set at £35 & includes the first hour in addition to any works completed. Bretty love every room, even the kids “No mums allowed in” room. Honestly, kids are kids as they shrug there shoulders with looks of its ok, not my choice of colour - but I can see how much more happier they are. You’ve changed our world, it’s great - thank you Brett. I’ll only work with the best materials available and I never compromise quality for time and give my clients realistic schedules that accommodate their lives. I strive for honest customer service, so contracts are only paid in full when the finished work is to your complete satisfaction as per the agreed works. I started working as a painter and decorator nine years ago. I love the feeling of working with a client to identify their needs and to then use my skills to create the look and finish they desired for their flat or house. I am a City & Guilds certified plumber and consider myself a plumber extraordinaire!